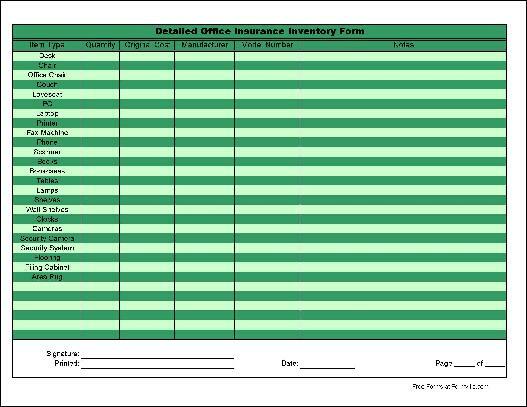 Form Description: This Basic Detailed Original Cost Office Inventory form has been designed to help you keep track of the items that you have in your office for insurance purposes. It can be used to help keep track of the items that you have around your office, or business. As you write down the information, that you can also keep track of the original cost that each item had. Print out as many pages of the form as you wish, and simply write down the information that is requested. In the event that you have a break in, accident, or some other type of loss you can simply use a copy of this form to figure out what the total loss was, and what exactly was damaged. While already detailed with a lot of information, there are some empty slots at the bottom of the form that you can use to help personalize the form for your particular form. You can download a PDF version of the "Basic Detailed Original Cost Office Inventory Form" form absolutely free. You can also, for a small payment, download a fully editable version of the form that you can customize as you desire. (Don't know which format to choose? Here's how to make your choice.) What would you like to do? Formville's free "Basic Detailed Original Cost Office Inventory Form" form is associated with the following keywords: insurance, basic, detailed, original cost, office, inventory.